Many MTB riders are often perplexed at the use of a power meter during their training. How is training with power on a mountain bike and a road bike different? In this article I’ll show you how to train with power on a mountain bike and why it can be a valuable tool for increasing your performance—as long as you are on the right terrain to train a specific metric. Let me explain. If you go out on a fast ride or do a race with a power meter on your road bike, the data collected is valuable. You can see what power and corresponding heart rates were produced for the entire ride and during key sections of the ride. Combined with your personal debrief of the ride (weather conditions, drafting comments, places on the course where you were strong or weak, as well as any other pertinent details)— training zones, goals and training objectives can be established. Achieving your training objectives will go a long way toward meeting your performance or results goals. If you train with a power meter, one of your goals will surely be to hit certain power numbers aimed at improving distinct areas of fitness. Let’s look at these fitness areas. Keeping track of power numbers for endurance work on the road and mountain bike is very similar. Over the course of time, you are looking for the most speed for the least effort. For my riders, I will mix up assigning these rides based on power zones and heart rate zones. I do this so I can watch when average power numbers increase for a given heart rate zone, or when average heart rate decreases for a given power zone. For road racing, aerobic endurance can be on completely flat terrain, rolling hills or tough hills. Endurance power demands for a flat course are slightly different than for a hilly course. The riders I’ve worked with tend to generate slightly higher power outputs in the hills than on the flats. For mountain bike racing, there is always climbing involved in the power numbers, even for long endurance racing. 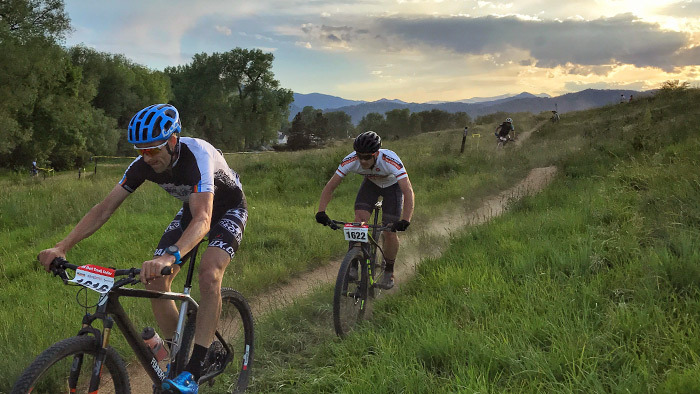 When working on endurance, the challenge on the mountain bike is to select a course that isn’t so difficult that you are constantly riding at threshold or above. This is especially true if the purpose of the workout is recovery. The ability to maintain a high and steady power output at lactate threshold is tough. This effort is the power output required to go fast for a time trial lasting roughly an hour. Some people tend to think of this effort as only needed for time trials, but it is really a fitness needed for all races between 60 and 180 minutes. I like to train this fitness marker by assigning intervals some three to 10 minutes in length, with easy recoveries (about 1/4 to 1/3 the time of the work interval). Finding a good stretch of road to do this kind of interval training on is relatively easy. Off-road threshold interval training can be more difficult. On the mountain bike these intervals are best done on a good stretch of dirt road, two track or relatively smooth single track where power values can be more tightly controlled. The next area of fitness is called aerobic capacity, anaerobic endurance, speed endurance or VO2max by various coaches. These are relatively high average power outputs sustainable in a race situation for some 30 minutes, give or take. Interval training for this might look like high, sustained power for three to five minutes with equal recoveries. offer a good spot to recover. The issue with aiming to do structured, controlled training in this zone is that you need to be able to control power output and recovery is critical. If the terrain won’t allow you to control power or perhaps even look at the power meter because you need to keep your eyes on the trail, then the purpose of the workout is lost. On the road bike, this is an all-out sprint lasting for less than 45 seconds. On the mountain bike, it is most often an all-out power effort to clear an obstacle. In both cases, effort is the measure and watching the power meter is less of a goal. The real goal is to produce as much power as you possibly can, along with very generous recoveries of some three to five minutes. It’s easy to sprint on a road bike and then recover. A good mountain bike course for this kind of power output would be a steep uphill where keeping a focus on terrain is not an issue, or, working on both skills and power at the same time by using a high power output to get over a technical obstacle. Recovery after the obstacle is key. My preference is to first work on high power output on easy terrain, then moving to more technical terrain. It’s a lot easier to ride technical trails when your high-end power is trained. You can use the same power zones on a road bike that you do on your mountain bike. However, doing intervals or structured workouts on the mountain bike is more of a challenge because you must select a course that will allow you achieve the goals of the session.